Still wondering what you are going to make for Thanksgiving? Maybe you have some gluten free family members or friends coming to dinner? Maybe you are newly gluten free yourself? Or maybe you just looking for some new and healthier gluten free recipes? If so, I've got you covered! Click in the links below for my gluten free Thanksgiving recipes! These cookies are a cakey, pumpkin spice cookie topped with a delicious coconut milk frosting. The recipe uses the pumpkin the reduce the butter content in the recipe. And by making the frosting with coconut milk, the frost mimics the flavor of a cream cheese frosting without all the fat and heaviness of a cream cheese frosting. This recipe is easy to make and will be a big hit at your holiday gathering with both kids and adults! These little mini cheesecakes are a big hit on the Thanksgiving dessert table! They are already portioned out and can be pretopped with a dollop of homemade whipped cream and a dash of pumpkin pie spice for an extra special treat. I use Neuchâtel cheese in this recipe. This is a good way to reduce the saturated fat content some without sacrificing flavor. I'm not going to go as far as saying that they are healthy, after all they are cheesecake still, :) but at least the saturated fat content is reduced by using the Neuchâtel cheese. I also use maple syrup in this recipe as the sweetener. It is a better sweetener choice and adds to the flavor! So maybe it just isn't Thanksgiving to you unless you have a piece of pumpkin pie. Well, I've got you covered there too! Check out my recipe for my gluten free pie crust. It is a simple, straightforward recipe that can be the base of any holiday pie of your choosing. I use butter and shortening in the recipe to get the flavor the butter provides and get the flakiness from the shortening. It is actually a really simple crust to make. And since it is homemade, there are no artificial ingredients or trans fats to worry about! Okay, so we can't have only dessert for Thanksgiving dinner, right? Luckily most of the savory Thanksgiving dishes are naturally gluten free. Just be sure to read all the labels and watch for additives that may contain gluten. As long as the dishes are made without gluten containing additives, your turkey and veggie side dishes should be safe. There is one side dish that someone who is gluten free has to pass on every Thanksgiving though...at least every Thanksgiving until this one. :) And that dish is stuffing, or dressing, or filling, whatever you call it in your part of the country. If you have been looking longingly at the stuffing dish as it passes you by then this recipe is for you! This gluten free stuffing dish is so flavorful that all the non-gluten free people at your table will want in on it too. So make sure you make enough to share! I am so excited to share this recipe with you! This recipe came to me one day and I thought it seemed like a good idea. 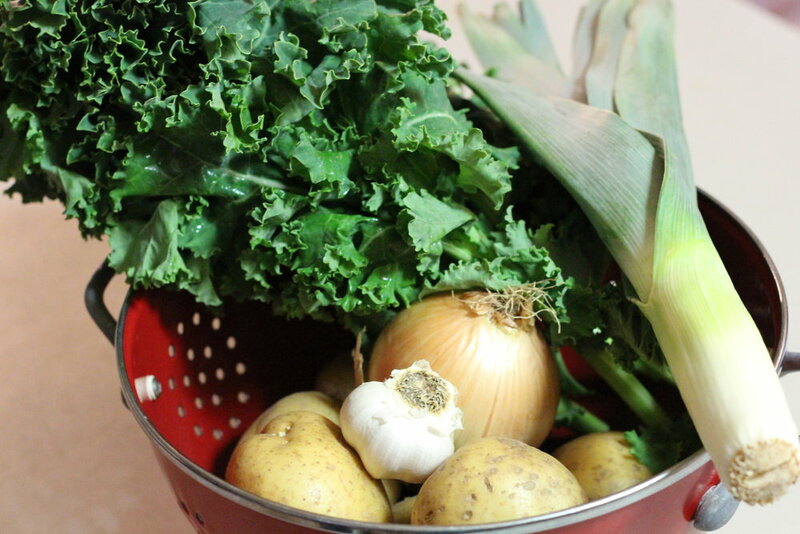 I loved that it would be such a healthy soup with the kale, leeks, potatoes, onion and garlic. In my mind, it seemed like it would be really tasty too. I finally got to make it and I was blown away by how beautifully all these flavors combined. They all complimented each other so well. This soup is so incredibly delicious! I am really proud of this one and eager to share it with you so that you can make it too. Enjoy! Heat oil in a large pot over medium heat. Add onion and garlic and sauté until nearly translucent. Add the leeks and sauté for another couple of minutes. Add the vegetable stock, water, salt and potatoes. Bring to a boil then simmer for 10 minutes, until potatoes are softened but still slightly firm when pierced with a knife. Add the pieces of kale leaves and simmer for 5 more minutes. Remove from heat and serve. Makes about 6 servings.